Containing quality ingredients and no artificial flavors, Monin premium vanilla syrup is a quick and easy way to add bold flavor to a variety of recipes! Add a splash of this vanilla syrup to your popular coffee and espresso-based drinks and it's sure to please your guests. The smooth, warm taste of vanilla will enhance the flavor profile of your hot, iced, and blended drinks without overpowering them or being too sweet. You can even mix this syrup with dairy and use it for shakes, lattes, and whipped cream. I love the Monin brand of Vanilla. It has a great thick consistency and is not watery. This vanilla makes a great addition to any espresso drink but especially great in a traditional Vanilla latte. This vanilla flavoring syrup is my favorite! I love to add it to my coffee, but guests of our restaurant like to add it to Coke. There are so many uses. Monin has been our favorite brand to work with for our specialty coffees and teas they are perfect for mixing with our lattes or just sweetening regular coffee. They don’t taste artificial and are all natural. Vanilla is really popular here! Great vanilla syrup that I've used to help flavor my meads and to make homemade sodas. I use this in my homemade orange cream soda, and that's my favorite one! One the nice things about this syrup is that it is stronger than some of the others. That means you can use less and save some money. Great in cocktails and coffee. Monin Vanilla Flavored Syrup is great. We use it in coffee drinks as well as at the bar for some of our specialty cocktails. It is price great here as well. If you are considering coffee syrups for your coffee shop or home use I would recommend monin’s vanilla syrup over other brands. It’s got more of a natural, smooth flavor that isn’t artificial or cloying like others tend to be. It also has a good amount of sweetness without being syrupy. A wonderful tasting vanilla syrup that is excellent for flavoring our fudge and candies. The syrup is very rich and gives our sweets a nice bold flavor. I love this vanilla flavored syrup! I add it to my ice coffee and adds the perfect vanilla taste. It isn't too sweet. I would recommend to others. This vanilla syrup is a good balance of sweet, but not too sweet. It compliments coffee beverages well, however it is still much more affordable to make homemade. Vanilla is different then most. Not very strong or heavy. No weird aftertaste. Remember to purchase the specific pump for this, the others won't work. Also note webstaurant puts labels on their bottles which ruins their appearance. Monin has by far the best syrups in the business. The vanilla syrup is no exception either. It has thats sweet vanilla flavor i was looking for to make that classic vanilla latte. Love this Monin syrup! Without being too sweet, the vanilla syrup adds the perfect amount of flavor to our espresso drinks. We have even been adding it to our vanilla shake to really amp up the flavor. A great vanilla flavoring syrup that is excellent for making the best coffee drinks in town. A great rich and bold flavor and our best selling flavor. There is no comparison between the brands of available syrups....Monin is "top-shelf" and we will not use any other brand for our espresso bar services. I love the Monin line of syrups! They are always true to flavor. The glass bottles give a nice, upscale look to our coffee bar. This is a decent vanilla syrup that seems to have a good vanilla flavor. Will probably try some other flavors in the monin brand and see. This syrup has a smooth flavor and pairs perfectly with coffee for a mixed drink or latte. A great price for the amount and quality. A great vanilla flavoring syrup that is perfect for our bakery. Makes great tasting coffee drinks and great for making vanilla whipped bagel cheese spread. So we have tried many other brands, but none of them compare to this brand. They have some of the best syrups that I have ever tried. They are also the only brand that we currently offer in our shops. This syrup has a smooth flavor, just make sure that you go easy on it. Good syrup - no strange aftertaste or chemical taste in our drinks. We love this brand and it is of great quality. Very happy with this purchase. This is my first time trying the product. I honestly like it a bit more than the Torani brand equivalent. There are less ingredients in this Monin syrup and it does NOT have any preservatives. I can taste the difference. Greate quality vanilla syrup! Monin's Vanilla syrup is better than the other brands. However, the French Vanilla is world's better than the Vanilla. Put them side by side and everyone will always prefer the French Vanilla in lattes and coffee beverages. The only time Vanilla is better is in things like soda...for example, you can put it in coca cola to make a Vanilla Coke, whereas you probably don't want a French Vanilla Coke. I recently became self taught barista and decided to try out a bunch of syrups and love this premium vanilla syrup from Monin. A great syrup to make our classic late. I can not get enough of this great tasting syrup. A great quality and perfect for adding vanilla flavor to sodas like coca cola. Yum. An awesome tasting vanilla flavoring. The syrup is great in my coffee. Tastes really good and authentic. Love that I can use my pump with the bottle. I like this Monin premium vanilla flavoring syrup a lot better than the one that I bought at one of our local stores. It is perfect! A good vanilla flavoring syrup. It works great for adding flavor to our coffees and lattes. The bottles are great for our pumps and store well. This syrup is a great size for home use and the quality is fabulous. There are a ton of flavors to choose from and the quality can't be beat! A wonderful premium vanilla flavoring syrup that is great for making custard and flan. I love the real vanilla bean taste and its great for all my baking needs. You will love this Monin syrup. Very tasty for a store-bought syrup. We use two pumps (0.5oz) in a 12oz drink which seems just right. Much better than Torani or any other brand. Monin premium vanilla syrup is by far the best tasting syrup. You can just taste the quality of the product. Our coffee drinks are well received every time! Love this syrup for making premium coffee drinks. There is no better quality than Monin's syrups. They come packed very well and are actually cheaper from here than Monin itself! We were so happy to find this VEGAN vanilla syrup for our vegan coffee shop. It tastes and smells delicious, and pairs well with our espresso and oat milk. We love our Monin Vanilla syrup! No other brands hit the spot quite the same as Monin. We go through A LOT of vanilla and have never had an issue with their flavor! Our customers love the flavor of this syrup, which we use frequently in our hot and cold coffee products. We have tried other products, heads and tails above the rest! We love this vanilla syrup. It's a staple in our coffee shop and we go through bottles of it faster than water! Monin syrups are our favorite and have won several taste tests we've done when comparing other brands. It's simple, vegan, and a delicious addition to drinks on our menu. 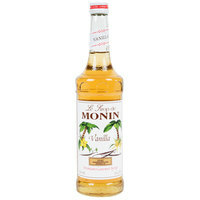 A nice vanilla flavoring syrup from Monin that is excellent for flavoring my coffee. I love trying new flavors, but vanilla is always my go to flavor. The syrup is flavorful and does not simply taste like sweet sugar. This is great vanilla syrup. We use it to make whipped cream. It has a nice flavor and doesn't contain any weird ingredients. Just vanilla and sugar. A top quality flavoring syrup with a rich, and decadent vanilla flavor. It smells and taste like pure vanilla beans and makes my espresso based drinks taste divine. Not so sure what flavor to add to your smoothie or coffee? Always go with Vanilla! Unforgettable taste, you will miss. You will come back for more! Best Vanilla syrup we've ever tried. It's gives drinks a nice, subtle vanilla taste while sweetening the flavor without overpowering it though. I highly recommend for coffee shops. These Monin syrups make the best iced coffee there is. We have customers come in on a daily basis just to get our iced coffee. Monin has a history of top-notch syrup products that can be hard to come by. The premium vanilla is as authentic as it gets and made with pure cane sugar. No artificial ingredients in this top shelf product. Goes great in a variety of drinks / milkshakes! This is probably our bestselling flavor option in our coffee bar! We love Monin brand so much. Every flavor is unique and magical and our customers adore it too! I love this Monin flavoring syrup. It's great for all you're at home coffee needs. With the classic vanilla flavor I love to make my own lattes. Or add to some rum for a great drink. The vanilla flavoring syrup is very useful in the shop. We love it because it ads a ton of flavor to our white and vanilla drinks. Vanilla is easily the most ordered flavor at our coffee shop and Monin does it the best! We tried several other popular brands when we opened and this was a standout favorite. Great vanilla flavor, without the alcohol taste of some syrups/extracts. Works great alone to flavor a coffee or latte, or can be partnered to balance out stronger flavors like cinnamon or pumpkin spice. Being a coffee shop I use A LOT of Vanilla syrup! This is definitely my top brand! They don't skimp on flavor or aroma. I love how it mixes well with other flavors and balances them out! Nice and full Vanilla flavor of this syrup will let your creativity to make a unique drinks! You will love this syrup from Monin! Highly recommended. I'm pretty picky about vanilla flavorings in general but his one is spot on and doesn't take fake or artificial. Perfect for mixing drinks. Great product. When you want to give your customers the best! We only trust Monin for our students! No artificial taste, keeps them coming back for more! Vanilla is a wonderful flavor and is often used to enhance other flavors. This Monin one is no exception. Its flavor is a definite plus. We ordered six flavors of Monin syrup for a welcome dinner at our wedding, and they were all a hit with kids and adults. The bottles arrived very well packaged. Some of the shipping stickers were a pain to take off - they were covering the flavor of the syrup - but gentle pulling removed them without too much damage to the label. People seemed to use/prefer less syrup than we expected, and less than the 4 pumps per drink that Monin recommends, so we have plenty of extra after an evening with about 60 people. I was surprised at how much Vanilla we had at the end of the night based on the number of people who had it, but that is likely because they were almost all combining it with other flavors and so only using 1-2 pumps at a time. Makes for some great flavor combos. A staple in our cafe. Many drinks come with a vanilla shot so the price on mix & match is greatly appreciated. Will order again! Monin syrups are great. The flavors taste great, are of high quality and most are GMO free. This is a great flavor for italian cream soda! The only issue we've had is with shipping. Monin has done it again. This vanilla syrup is most definitely premium. Its delicious, rich vanilla flavor is reliable and consistent. Great quality product! Five stars. I tried some of this vanilla syrup in my coffee last evening, and it was delicious. I will be buying more flavors to try as well in the future.